What is a potato ring? Among the many pieces of silver in the museum collection is an unusual item that people living in the 21st century would have a hard time identifying. 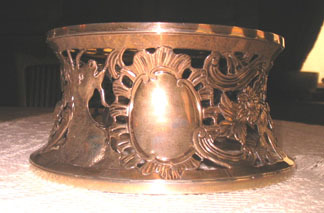 The elaborately decorated piece is known as an Irish potato ring. These pieces served a simple function – to hold baked potatoes. The ring, which is open on the bottom, would be placed on a large round plate and then filled with the potatoes which could then be removed by the diner with appropriate tongs. Our particular potato ring is sterling silver and was made in 1882 by the firm of Lambert & Rawlings. That firm, founded by Frances Lambert and William Rawlings, began operation in the mid-19th century in London. They produced a wide range of both ecclesiastical and domestic pieces, many of which were exhibited at the Great Exhibition of 1851 (the Crystal Palace). The firm survived well into the 20th century and was later known as Harman & Lambert. The ring is marked “Lambert, Coventry St., London" and features several hallmarks that identify its silver content and year of manufacture. It is 8-1/2” wide at the base and stands 4” tall. The elaborate pierced body features scrollwork, with foliate and chinoiserie figural motifs, highlighted with animals including a goat and a lion, surrounding two irregularly shaped cartouches. The ring shows up in photos of the dining room taken in 1923, sitting on the lower shelf of the sideboard at the left hand side. Frances Glessner found another use for the ring (or “rim” as she called it) on at least one occasion. When the Glessners celebrated their 25th wedding anniversary with a dinner for friends and family on December 7, 1895, the ring was used as the centerpiece and was filled with 25 pink roses. Today, the ring sits once again on the sideboard, and each year at Christmas, is filled with (rubber) potatoes. Be sure to notice the piece on your next visit to the museum.